Often times, homeowners avoid the renovation of their homes for a fear of the cost of it. What they do not know is that there are ways to refurbish a house even with a tight budget. We are here to provide practical and budget-friendly tips for home renovation. If your kitchen cabinets are still in ideal shape, but need their appearance updated, just replace the doors with ones in a current style. Finish the cabinets and doors with matching paint or stain. In addition, add stylish door pulls to complete the remodel. 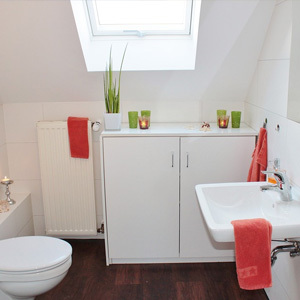 This idea also will work for a mini remodel of a bathroom. Hire professionals to install additional storage options in the way of shelves in the bathroom, for another home renovation idea. The style of the shelves can vary according to whether they are for storing towels or your cosmetics. In the kitchen, you may consider a pantry by adding a tall cabinet that goes from the floor all the way to the ceiling or the top of the upper cabinetry. Closets are easily made more functional by adding shelving or drawers along with hanging rods. Install new countertops on existing kitchen or bathroom cabinets. An action such as this will improve the appearance of the room dramatically and may or may not include a new sink depending upon your needs. Marble, granite, wood and quartz are just a sampling of the popular countertop materials today. Bring the light into the rooms with LED lighting, mirrors and glass features. LED lights come in a number of different shapes and styles today to illuminate the rooms in a cost-saving manner. Mirrors not only bounce the light back into the room, but also create the illusion of space. Glass features such as glass-front cabinets and glass splashbacks refract the light into the room in various directions. Quit thinking that you need to gut a room to renovate it. As you can see by the above ideas, there are ways to refurbish without tearing out everything to start from scratch. To save money, only gut the room when the entire room needs it. Before you decide on an extension, be certain that your budget will handle such an expense. Adding an extension may be for the best in certain cases, but you must understand that the cost is higher than other renovation ideas are, and you do not want to overdo according to your budget. The moral is here to keep your home renovation practical and within your budget. Plan carefully, and you will soon realise how easy it is to remodel a house even with limited funds.